Got plans for travel on some back roads? Planning to travel up to Alaska? Worried about stones and pebbles being kicked up and breaking out your headlights? Then this little item is exactly what you need. 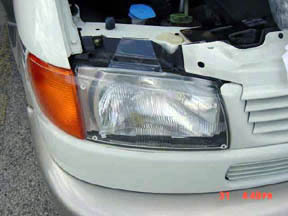 These are acrylic shields which mount in front of the glass headlight protecting it from stones and other objects which could cause costly damage. There are currently no known sources for these. The previous source, carbras.com, no longer lists them for the Eurovan. If you know of a place to get them, please let me know and I'll add their information here.